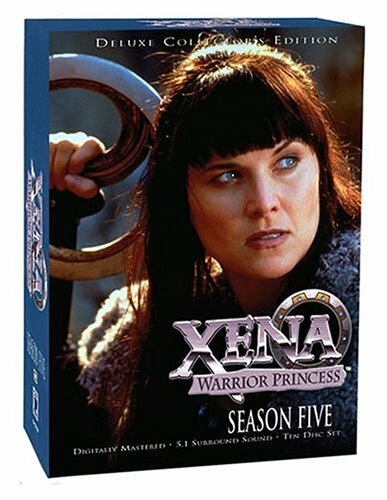 Xena: Warrior Princess (The Complete Fifth Season) - BUY THIS DVD! This season of this Sam Raimi-produced cult series sees Xena the Warrior Princess (Lucy Lawless) make the alarming discovery that she's pregnant. While she's unsure of whose child it is, its very existence has caused a violent rift between the mortal and immortal worlds. Includes all 22 episodes from the fifth season. THEN SEND IN YOUR NAME AND ADDRESS TO contests@efilmcritic.com. Put "ALL I WATCH IS XENA THE WARRIOR PRINCESS" in the subject line and cross your fingers. There will be 3 lucky winners. We will draw names and one of the DVD packages will be yours. Only 1 entry per household.